Medicine Bow Lodge Dude Ranch Mountain Cabins Saratoga WY Medicine bow national forest. Where will you go this summer? Memorial Day is only a two months away. We make adventure vacations easy! We are all inclusive, no added fees. Let us help make your family vacation easy. Call us at (800) 409-5439 or email us at lodge@medbowlodge.com or message us on facebook. Do something special for your family next summer. Proud Member of Dude Ranchers Association. The Medicine Bow Lodge And Guest Ranch is located at approximately 8200 feet in the Beautiful Snowy Range of the Rocky Mountains. The closest town is Saratoga, Wyoming which is about 22 miles to the west. The land on which the Guest Ranch sits is located in the Medicine Bow National Forest. 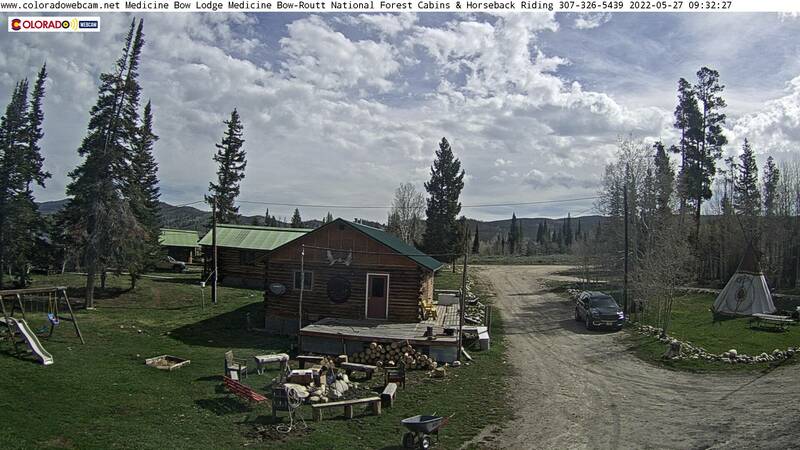 Click here for Medicine Bow live web cam Time Laps player. Click here for More Live Webcams from coloradowebcam.net network. My name is Tim Bishop and I am married to Deborah Bishop. We bought the Lodge in 2002. We have worked hard to establish a place where family and friends can vacation while enjoying each other in a lodge setting. We have a lot to offer our guests with the help of our family and staff. Our meal plan is great, lots of good food and plenty of snacks. We can provide special diets if you let us know your needs. We will have coffee, tea and other refreshments available for you at your convenience. All of our rooms are clean and have their own private bathroom. The Lodge is always open for our guest to enjoy. You can enjoy reading a book in the Fireside room, while kids play billiards in the game room; just sit on our back porch and listen to the stream as it flows over the rocks. Just remember this is the West and time just seems to go slower around here. But just in case, we do have a phone, and internet for our guest, as long as they promise to enjoy themselves. In the winter you can snowmobile right from the lodge, cross county ski, snowshoe or just play in the snow. When summer arrives, it is time for horseback riding, exploring, relaxing, and having a good time. Our number one rule is simple...Relax and Enjoy.